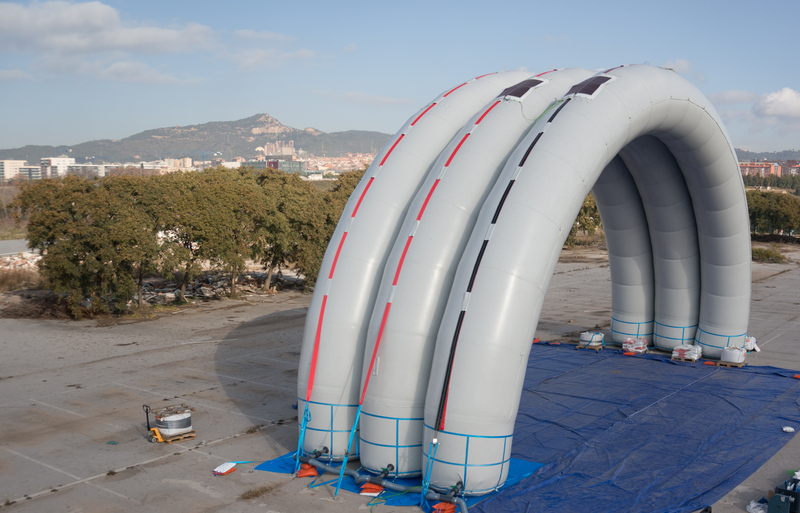 <h2>Inflatable, self-sustaining and extendable – the new breed of emergency shelter </h2><br /><p>When disaster strikes and people scramble to safety or search for loved ones, they may not immediately notice a lack of power. But as night closes in they can soon struggle to find shelter, prepare food and call relatives.</p> <p>Thanks to a host of new materials and technologies, however, emergency facilities are getting smarter – and they don’t have to be hooked up to the electricity grid to do so.</p> <p>Take the self-sustaining, inflatable shelter with integrated solar panels designed by the EU-funded uLites project. Normally, inflatable shelters require a power source to maintain their shape and ensure they do not deflate over time. The integrated solar panels on the uLites shelter provide this energy, meaning they can be deployed in areas that are completely cut off.</p> <p>The shelters are composed of a series of airtight inflatable tubes that can be folded for easy transport, as well as a separate sheet of solar panels, one for each tube, that are fastened to the shelter via rope.</p> <p>‘When you fold the shelter it occupies very little space, so you can bring it inside a truck or inside a plane or helicopter if it’s necessary to reach difficult areas,’ said Carles Estruch, head of research and development at Spanish company Buildair, who coordinated the project.<span><br /></span></p> <p>The shelter is built by extending the tubes on the ground and allowing them to inflate into their natural arced shape, which usually takes about 30 minutes. The solar cells, which are embedded onto a flexible textile, are then raised onto the shelter.<span><br /> <div class="citationsBlock"> <h3>The Issue</h3> <p>The EU’s External Action Service has multiple procedures for emergency response, including a <a href="http://eeas.europa.eu/crisis-response/what-we-do/eu-situation-room/index_en.htm" target="_blank">‘Situation Room</a>’ which continuously monitors for humanitarian disasters around the world 24 hours a day.</p> <p>The EU is the highest donor of <a href="http://ec.europa.eu/echo/what/humanitarian-aid_en" target="_blank">humanitarian aid</a> in the world with almost EUR 1 billion aiding some 120 million people annually. Around 19 % of this funding went to providing shelter in disaster areas in 2013.</p> <p>Under the Horizon 2020 funding programme the EU supports projects that are working to <a href="http://ec.europa.eu/programmes/horizon2020/en/h2020-section/secure-societies-%E2%80%93-protecting-freedom-and-security-europe-and-its-citizens" target="_blank">keep people secure</a>, including in the face of natural and man-made disasters.</p> </div> <p></span></p> <p>The uLites project focused on making their tubes as airtight as possible to reduce the energy needed to keep them inflated and ensure they could rely on solar power.</p> <p>‘By measuring this correctly, we could charge a battery with the energy of these cells,’ said Estruch. ‘This battery stores the energy to be used when the pressure of the structure goes below a threshold.’</p> <p>What’s more, each tube is designed so that the shelter can be extended. ‘If you need more length, you add more,’ said Estruch. ‘And they are independent so you can bring as many tubes as you need.’</p> <p>Another project, called S(P)EEDKITS, created a backpack kit that can be given to victims by aid workers and includes a quickly deployable shelter, known as Clever Roof. This can not only be assembled in different configurations depending on the terrain, but can further be equipped with a solar panel with a USB socket and a magnetic connection so that it can be attached to the outside of the shelter.&nbsp;</p> <p>‘The main reason for that is that nowadays – even if you have let’s say relatively poor countries – most of the people do have some electronic devices, typically a mobile phone, and so it’s very important afterwards that people can communicate,’ said Guy Buyle, the project’s coordinator.</p> <p>‘Of course it depends a lot on the climate, but in principle if you have it the whole day on the tent you should have more than enough energy for a couple of hours LED light or to charge your phone.’</p> <p><img src="/sites/default/files/shelter_socket_picture_large.jpg" alt="The solar panel that can be attached to the outside of the Clever Roof shelter allows people to power an LED light or charge a mobile phone. Image courtesy of S(P)EEDKITS" title="The solar panel that can be attached to the outside of the Clever Roof shelter allows people to power an LED light or charge a mobile phone. Image courtesy of S(P)EEDKITS" width="799" height="454" class="@aligncenter@" /></p> <p>The recently completed project, based at Belgium’s Centexbel research centre, worked to find new ways to deliver faster and longer-lasting resources.</p> <p>‘There is a big need to get a lot of material in a short time to the place of emergency,’ said Buyle. ‘We have two important boundary conditions, the speed and the seed.’ This means that not only should supplies be able to get to an affected area as quickly as possible, but they should also be useful for a longer term than just the days following a disaster.<span style="font-size: 13.008px; line-height: 20.0063px;"><br /> <div class="quote-view quotesBlock quote_vertical_right"> <div class="quotesTop"><img src="https://horizon-magazine.eu/sites/all/themes/horizon/images/quotes_top.png" alt="" title="" /></div> <p><span>‘There is a big need to get a lot of material in a short time to the place of emergency.’</span></p> <blockquote><p>Guy Buyle, Centexbel, Belgium</p></blockquote> <div class="quotesBottom"><img src="https://horizon-magazine.eu/sites/all/themes/horizon/images/quotes_bottom.png" alt="" title="" /></div> </div> <p></span></p> <p>The team has also developed a premade biogas bag that can turn waste or manure into biogas. Microbial digesters within the bag use this waste to produce a gas that can then be safely used by people, for example to cook food.</p> <p>They also designed a shipping container specially fitted with medical equipment and called the Hospitainer that can be used for maternity care or even for performing surgeries.</p> <p>For the increased energy demand, the containers rely on generators, though a small amount also comes from solar cells. The containers can also be joined together to make larger medical centres if needed.</p> <p>After collaborating with international organisations such as Médecins Sans Frontières and the Netherlands Red Cross, the team has seen their kits deployed in Senegal, while the Hospitainers have also recently been sent to Sudan and Syria.</p> <br /> <img src=”http://www.google-analytics.com/collect?v=1&tid=UA-40077089-1&cid=inflatable-self-sustaining-and-extendable-–-the-new-breed-of-emergency-shelter-&t=event&ec=republish&ea=read&el=inflatable-self-sustaining-and-extendable-–-the-new-breed-of-emergency-shelter-&cs=republish&cm=republish&cn=republish&cm1=1" /> This post <a href="https://horizon-magazine.eu/article/inflatable-self-sustaining-and-extendable-new-breed-emergency-shelter.html">Inflatable, self-sustaining and extendable – the new breed of emergency shelter </a> was originally published on <a href="https://horizon-magazine.eu/">Horizon: the EU Research &amp; Innovation magazine | European Commission</a>. When disaster strikes and people scramble to safety or search for loved ones, they may not immediately notice a lack of power. But as night closes in they can soon struggle to find shelter, prepare food and call relatives. Thanks to a host of new materials and technologies, however, emergency facilities are getting smarter – and they don’t have to be hooked up to the electricity grid to do so. Take the self-sustaining, inflatable shelter with integrated solar panels designed by the EU-funded uLites project. Normally, inflatable shelters require a power source to maintain their shape and ensure they do not deflate over time. The integrated solar panels on the uLites shelter provide this energy, meaning they can be deployed in areas that are completely cut off. The shelters are composed of a series of airtight inflatable tubes that can be folded for easy transport, as well as a separate sheet of solar panels, one for each tube, that are fastened to the shelter via rope. ‘When you fold the shelter it occupies very little space, so you can bring it inside a truck or inside a plane or helicopter if it’s necessary to reach difficult areas,’ said Carles Estruch, head of research and development at Spanish company Buildair, who coordinated the project. The shelter is built by extending the tubes on the ground and allowing them to inflate into their natural arced shape, which usually takes about 30 minutes. The solar cells, which are embedded onto a flexible textile, are then raised onto the shelter. The EU’s External Action Service has multiple procedures for emergency response, including a ‘Situation Room’ which continuously monitors for humanitarian disasters around the world 24 hours a day. The EU is the highest donor of humanitarian aid in the world with almost EUR 1 billion aiding some 120 million people annually. Around 19 % of this funding went to providing shelter in disaster areas in 2013. Under the Horizon 2020 funding programme the EU supports projects that are working to keep people secure, including in the face of natural and man-made disasters. The uLites project focused on making their tubes as airtight as possible to reduce the energy needed to keep them inflated and ensure they could rely on solar power. Another project, called S(P)EEDKITS, created a backpack kit that can be given to victims by aid workers and includes a quickly deployable shelter, known as Clever Roof. This can not only be assembled in different configurations depending on the terrain, but can further be equipped with a solar panel with a USB socket and a magnetic connection so that it can be attached to the outside of the shelter. ‘The main reason for that is that nowadays – even if you have let’s say relatively poor countries – most of the people do have some electronic devices, typically a mobile phone, and so it’s very important afterwards that people can communicate,’ said Guy Buyle, the project’s coordinator. The recently completed project, based at Belgium’s Centexbel research centre, worked to find new ways to deliver faster and longer-lasting resources. ‘There is a big need to get a lot of material in a short time to the place of emergency,’ said Buyle. ‘We have two important boundary conditions, the speed and the seed.’ This means that not only should supplies be able to get to an affected area as quickly as possible, but they should also be useful for a longer term than just the days following a disaster. The team has also developed a premade biogas bag that can turn waste or manure into biogas. Microbial digesters within the bag use this waste to produce a gas that can then be safely used by people, for example to cook food. They also designed a shipping container specially fitted with medical equipment and called the Hospitainer that can be used for maternity care or even for performing surgeries. For the increased energy demand, the containers rely on generators, though a small amount also comes from solar cells. The containers can also be joined together to make larger medical centres if needed. After collaborating with international organisations such as Médecins Sans Frontières and the Netherlands Red Cross, the team has seen their kits deployed in Senegal, while the Hospitainers have also recently been sent to Sudan and Syria.